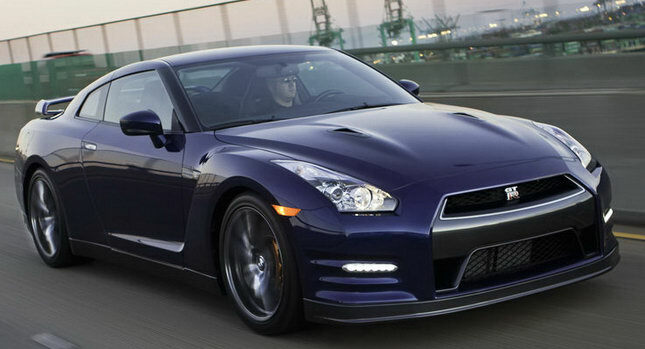 The Nissan GT-R 3.8 V6 2012 U.S.-spec model squeezes 530 ponies out of the 3.8-liter twin turbo V6, also known as the VR38DETT, and 488 lb-ft (662 Nm) of asphalt shredding torque � all without any heavy modifications. Engineers fiddled a bit with the boost pressure, gave the valve timing a mild makeover and optimized the air mixture ratio. That sounds like half of a Japanese workday. OK, one full day, if we acknowledge the improved aerodynamics as well. The front fascia was modestly refreshed and now features double rectifier fins, which optimize the airflow around the supercars nose. The air intakes are bigger, too, and more efficient in cooling the engine and the front brakes. We dont know yet how these changes are going to affect performance, cause Nissan is all too secretive about official figures, but you really dont have to be a rocket scientist to realize that this car will be very, very fast, given its history. Visually , the new LED running lights deserve a mention, accompanied by the plated inner headlight panels, which according to Nissan, enhance the GT-Rs presence. In total, six exterior colors are available, including two brand-spanking new: the Deep Blue Pearl and Jet Black.